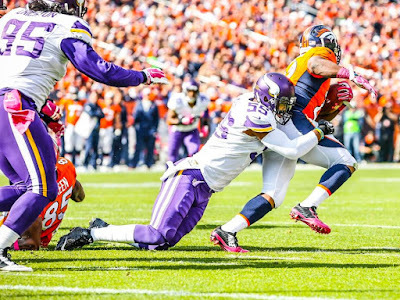 The Vikings put up a good fight and nearly pulled off a comeback win in Denver. It wasn't enough, as they fell 23-20 to the Broncos. Daniel House provides his takeaways from today's game in Mile High. After trailing 13-0 to start the game, along with a missed 38-yard field goal by Blair Walsh, the Vikings still managed to claw their way back into the game. They surrendered a 72-yard touchdown run in that span that really started to open the offense up for the Broncos. However, the Vikings would pick up a field goal and an interception by Anthony Barr before halftime. That turnover led to a 4-yard touchdown from Teddy Bridgewater to Mike Wallace and the Vikings trailed by just three points at halftime. Coming out of the break, the Vikings defense surrendered an 8-play, 80-yard drive, that was capped by a 1-yard touchdown on 4th-and-goal from Peyton Manning to Owen Daniels. It put the Vikings in a difficult position as they trailed by ten points to start the second half of play. The rest of the half was scoreless until the start of the fourth quarter. Adrian Peterson busted a 48-yard touchdown run, which was sparked by brilliant blocking up front by Brandon Fusco, Matt Kalil, and Joe Berger. Peterson was essentially untouched and closed the gap to just three points. On the next possession, safety Harrison Smith hauled in an errant Peyton Manning pass and it would later lead to a 33-yard field goal by Blair Walsh. Nonetheless, the Vikings defense allowed the Broncos to drive into their territory, adding a 39-yard field goal, giving them a 23-20 lead. Minnesota took over with 1:53 to play and two timeouts, but the offensive line allowed too much pressure on Bridgewater. This was a reoccurring theme throughout the game, but it came up costly at the end of this contest. T.J. Clemmings was beaten, T.J. Ward came on the blitz, stripped Bridgewater, and ended the Vikings comeback effort. Nonetheless, this team showed some excellent elements on both sides of the ball against a solid Denver squad who is very difficult to defeat at home. They came up short, but it certainly was an encouraging effort by many players on this team. The Broncos had problems getting their offense going in their first three games. That specifically was true in the running game. The Vikings allowed Ronnie Hillman to bust through the line of scrimmage for a 72-yard touchdown. This opened up the passing lanes for Peyton Manning to throw the ball. Denver hadn't been getting big play scores, but this was definitely a huge step forward for their offensive rhythm. Manning threw for just 213 yards in the air, but Minnesota allowed 144 yards on the ground, and it was the difference. It forced the Vikings defense to defend the run and took the top off the defense. I said in my pregame keys that Denver couldn't run the ball well and they certainly did. For the most part the Vikings were performing well on defense, but they gave up the big play several times. You can't do that against talented teams like the Denver Broncos. Minnesota can't protect Teddy Bridgewater the way they did today or he will be hurt very soon. Bridgewater was on his back seven times and he had minimal time to do anything through the air. In fact, he extended some plays with his legs and picked up two critical first downs on third-and-long. Denver has one of the best defenses in football and Bridgewater still managed to pass for 269 yards and a touchdown, despite the poor protection in front of him. Von Miller destroyed T.J. Clemmings on several occasions and Broncos defensive coordinator Wade Phillips was bringing a massive amount of pressure on his side during the final drive of the game. 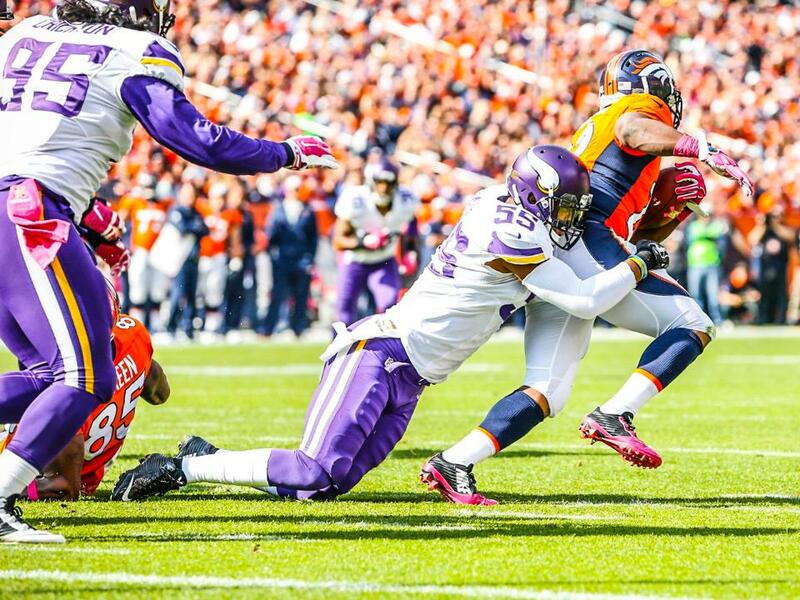 T.J. Ward came on the blitz, stripped Bridgewater, and ended the Vikings comeback. Nonetheless, the Minnesota offense moved the ball down the field, but protection was the big difference today. Mike Wallace was heavily involved in the offense and hauled in his first touchdown in a Vikings uniform during the second quarter. He hauled in eight passes for 83 yards and a touchdown. Wallace ran some beautiful routes and caught a huge pass on third down to move the chains late in the game. It was definitely encouraging to see the Vikings start moving the ball through the air. Adam Thielen also had six receptions for 70 yards and added two huge first down grabs in this contest. He ran some good routes to get open and picked up some yards after the catch. Finally, Stefon Diggs made himself known in his first regular season NFL game. He led the team with 87 yards receiving yards on six catches. His most notable reception came on a route where he shook Aqib Talib and was wide-open to make a 19-yard reception on first-and-long. Diggs made some tough catches in traffic and flashed his crafty route running he showed on the practice fields in training camp. Anthony Barr shifted the momentum in the Vikings' favor at the end of the second half. He picked off a Peyton Manning pass, taking it deep into Denver territory. He read Peyton Manning's eyes and jumped in front of the throw intended for Emmanuel Sanders. The Vikings would take advantage of this turnover and scored a touchdown before halftime to cut the lead to 13-10. Barr was making a plethora of plays today, notching a team-high six tackles, and that key interception. Not to mention, he nearly stepped in front of another pass that could have been intercepted for a touchdown. Barr is a difference maker on defense and is the type of player that a team has to have in order to thrive on this side of the ball. Finally, in the fourth quarter, Harrison Smith hauled in a errant Peyton Manning pass and gave the Vikings offense good field position. It led to a 33-yard Blair Walsh field goal, but it wouldn't be enough as the Broncos added a 39-yard try on the next possession. The Vikings defense created plenty of opportunities today, but it wasn't enough for the team to pick up a comeback win in a tough road environment. Blair Walsh missed a 38-yard field goal in the first half and it really came back to haunt the Vikings when the game was over. Walsh hit from 33 and 38 yards out later in the contest, but the one try he missed ending up being critical as the Vikings lost by three points. Not to say other areas weren't weak in this matchup, but Walsh's kick certainly would have provided a different element to this game. Losing close games like these are difficult and a missed kick like this certainly makes it a little tougher to swallow. Walsh has lost his confidence and mojo and he must get it back so this type of performance doesn't hurt the Vikings again.